4/12/19 - New Class! "Rhythm Kids" Group Drumming Series, a hands-on, interactive and fun music making experience for ages 5 - 9. Thursdays at 6:00 PM, May 2nd through June 6th. 4/9/19 - Bus Trip tickets are now available to non-KMAC families, so if you haven't submitted your deposit yet, make sure you get it in ASAP! Click for the Bus Trip Flyer and Reservation Form. 3/26/19 - Just announced: Our next Bus Trip to Broadway will be Oct. 26 to see The Phantom of the Opera! Open to KMAC students, parents & supporters only until April 8th, available to the public after that. 3/10/19 - Spring Classes are available for registration! 2/22/19 - Concert at KMAC tomorrow! Free, all ages, rock 'n roll! Hope to see you there! 2/20/19 - Tonight's Homeschool Music meeting has been postponed due to the weather. We've rescheduled it for next week, Wed. 2/27 @ 7pm. * Click for HOMESCHOOL MUSIC INFORMATION NIGHT info and registration. 2/11/19 - Homeschool Music Information Night is next Wednesday, 2/20 at 7pm. Join us to discuss music education and events for homeschoolers in south central PA.
1/22/19 - Meet the Teachers Night is almost here! Participating instructors are Barb Gerber (concert Band instruments & Homeschool instruction), Beau Barber (Guitar), Brandon Rhody (Piano), Dani Fiore (Drums), Marie Valigorsky (Violin & Viola), Mary Sanden (Voice) and Rachel Stambach (Cello). Let us know if you'd like an appointment with one of these fine teachers (recommended), or just stop in to say hi. 1/10/19 - Early 2019 classes are available for registration. 12/25/18 - Merry Christmas and Happy Holidays to all of our students, parents, volunteers and supporters! We'll be posting interesting versions of Christmas songs all day today on Facebook - use the hashtag #KMACChristmas. 12/17/18 - Phil Freeman's vocal and songwriting classes are now available for registration on Eventbrite. All classes are on Monday evenings beginning January 14th. 12/10/18 - Wonderful Holiday Party / Open House yesterday - thanks to everyone who helped or participated in any way! Give us another day or two to recover before we post photos and update the website. 12/9/18 - Holiday Party / Open House is today! Everyone's invited to come in out of the cold for some holiday cheer. Performance schedule (1pm-3pm) is now posted. Registration still open for the Free Youth Piano Class (3pm-4pm). Please join us for music, food and fun! 12/7/18 - Time for set-up tomorrow is changed to 2pm. 12/6/18 - Holiday Party / Open House is this Sunday! If you can help out, please let us know ASAP. We need volunteers on Saturday and Sunday, plus donations of food and holiday decorations. Check out the volunteer/donations flyer for details. Thank you! 11/23/18 - Homeschool Information Night, originally scheduled for 11/28/18, is being rescheduled for February. More details TBA. 11/14/18 - Welcome to cello instructor Rachel Stambach! Meet all of our string (violin/viola/cello) teachers on Tuesday, Nov. 20th - contact us to schedule a time between 6pm & 8pm. 11/2/18 - Today is the last day to shop on Amazon and have 5% of your purchase price donated to KMAC. Go to smile.amazon.com, select Keystone Musical Arts Center, then shop and complete your order by midnight. That's it, simple - thanks for your support! 10/29/18 - Bus Trip deposits are due today. If you haven't reserved your tickets yet, contact us ASAP. As of 8am, we only have a handful of tickets remaining. Terry will be in today 3pm-8pm to help with reservations and deposits. Also, the Vocal Class for ages 8-12 starts tonight. We've moved the class to our new, larger space and have a few seats available. Click The Vocal Blueprint for info and registration. 10/22/18 - Bus Trip tickets are now available to non-KMAC families, so if you haven't submitted your deposit yet, make sure you get it in ASAP! Click for the Bus Trip Flyer and Reservation Form. 10/19/18 - Stop by our booth at the West Shore YMCA tomorrow afternoon - it's Halloween at the Y - music, games and free candy! 10/12/18 - As of this afternoon, tomorrow's Musical Theatre Audition Masterclass only has a few seats left. If you might be interested in attending, go to the Registration Page and click on "tickets" - it will then show you how many tickets are left. 10/5/18 - Voice class for ages 8-12 is now open for registration. Mondays at 7:30pm for six weeks beginning October 29. Watch the instructor's video explaining more about the class. 10/1/18 - We're going to Broadway to see Wicked! On Saturday, January 26, 2019 the bus leaves KMAC at 7am - we get a couple hours of free time in NYC, then a matinee (seats in the front mezzanine! ), dinner at Planet Hollywood (included) and then back at KMAC around 10:30pm. Check out the flyer for more detail and download the reservation form to submit with your deposit (due 10/29/18). 9/25/18 - Musical Theatre AUDITION MASTERCLASS on October 13th for middle and high school students is now available for registration - download the flyer to share with your friends - class size is limited, so register now! 9/11/18 - Beginner Piano Class for ages 6-16 starts this Friday at 4:30. Registration is still open on Eventbrite. 9/9/18 - Fall OPEN HOUSE is TODAY! Come in out of the rain for music. food and fun! Stop in anytime between 1pm & 3pm. Free PIANO CLASS at 2:30pm. And look at all those new teachers (under Private Lessons here to the right) - some of them will be performing and Barb will be demonstrating "Recorder Karate"! 9/8/18 - Fall OPEN HOUSE is tomorrow! Music by students and teachers - light refreshments - new instructors - Recorder Karate demonstrations - free beginner piano class - and more! Come in out of the rain and enjoy a warm, welcoming, fun event. 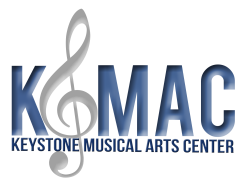 9/7/18 - Awesome work day at KMAC! 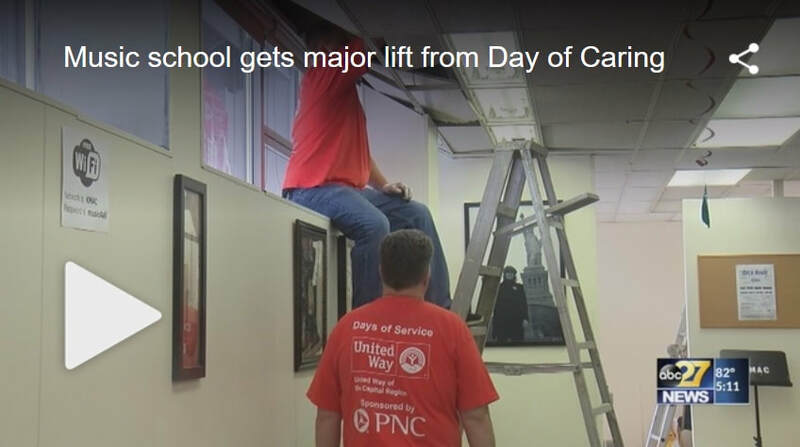 Volunteers from HARSCO, as part of the United Way's Day of Caring, spent hours moving, cleaning, organizing, caulking, insulating, power washing, and doing what ever else we had on our list. THANK YOU to all involved. Photos are being posted on our Facebook page. 9/3/18 - New teacher announcements have begun. First up is Barb Gerber who comes to us from a more traditional school music setting. She is available for private lessons on all concert band instruments, and she will also be heading up our HOMESCHOOL program! 8/23/18 - We're gearing up for fall with new teachers, classes and programs. Look for updates starting tomorrow. And be sure to stop by on Sunday, September 9th between 1 & 3 for our Open House! Most classes and new lessons will begin after that date. 7/24/18 - Registration for late summer classes is now closed. Stay tuned for our fall schedule. The next Open House will be on Sunday, Sept. 9, 1:00 PM - 3:00 PM. More details to be announced next month. 6/21/18 - The dates for our summer Piano and Guitar classes have changed. Beginner Piano Class now begins next week on June 29. Beginner Guitar Class for the summer has been moved to Tuesdays starting July 10. See our Calendar Page for the new dates, or click the "Register for Classes" button above for all the details and registration. 5/8/18 - Free Demo Youth Music Classes announced for next Wednesday! Two classes - 10:45 & 4:15. Registration will be available after we contact everyone who filled out a form at the YMCA Healthy Kids Day event or here at the school. 4/10/18 - The Beginner Guitar Class that starts this Thursday is now two classes - 4:30pm for ages 6-10 and 6:30pm for ages 11-16. We now have room to add students to either class! 3/29/18 - Beginner piano and guitar classes are available for registration on our Eventbrite page - scroll down to see the options. We could even add a student or two to the vocal class that started this past Wednesday - contact us if interested to schedule time with the teacher ton get caught up before the next class on the 4th. 3/12/18 - New teachers will be announced on Wednesday Come to the Open House on Sunday to meet them and learn more about our piano and voice classes! 2/28/18 - Great concert last Saturday! Thanks to everyone who helped, performed or were otherwise involved! Photos now posted on Facebook. 2/12/18 - FREE concert on Feb. 24! As part of the Millennium Music Conference, three very talented groups will be performing at KMAC as part of an International Youth Music Showcase. You are invited, bring the kids! See the Facebook event page for more info. 9/17/17 - Article just posted on Pennlive! 9/17/17 - The day has finally arrived! Please join us for the Grand Opening celebration today! Stop in anytime between 1pm & 3pm for music, food, info and fun! 8/27/17 - Lessons at the new location start tomorrow! 7/21/17 - Construction started at new location! 6/27/17 - Signed a lease for our our new location today!